Abstract: A combined fluid inclusion, fluid inclusion plane, lead isotope and K/Ar radiometric age dating work has been carried out on two lead-zinc mineralizations situated along the Periadriatic-Balaton Lineament in the central part of the Pannonian Basin, in order to reveal their age and genetics as well as temporal-spatial relationships to other lead-zinc- fluorite mineralization in the Alp-Carpathian region. According to fluid inclusion studies, the formation of the quartz- fluorite-galena-sphalerite veins in the Velence Mts is the result of mixing of low (0—12 NaCl equiv. wt. %) and high salinity (10—26 CaCl2 equiv. wt. %) brines. Well-crystallized (R3-type) illite associated with the mineralized hydrother- mal veins indicates that the maximum temperature of the hydrothermal fluids could have been around 250 °C. K/Ar radiometric ages of illite, separated from the hydrothermal veins provided ages of 209—232 Ma, supporting the Mid- to Late-Triassic age of the hydrothermal fluid flow. Fluid inclusion plane studies have revealed that hydrothermal circulation was regional in the granite, but more intensive around the mineralized zones. Lead isotope signatures of hydrothermal veins in the Velence Mts (206Pb/204Pb = 18.278—18.363, 207Pb/204Pb = 15.622—15.690 and 208Pb/204Pb = 38.439—38.587) and in Szabadbattyán (206Pb/204Pb = 18.286—18.348, 207Pb/204Pb = 15.667—15.736 and 208Pb/204Pb = 38.552—38.781) form a tight cluster indicating similar, upper crustal source of the lead in the two mineralizations. The nature of mineralizing fluids, age of the fluid flow, as well as lead isotopic signatures of ore minerals point towards a genetic link between epigenetic carbonate-hosted stratiform-stratabound Alpine-type lead-zinc-fluorite deposits in the Southern and Eastern Alps and the studied deposits in the Velence Mts and at Szabadbattyán. In spite of the differences in host rocks and the depth of the ore precipitation, it is suggested that the studied deposits along the Periadriatic-Balaton Lineament in the Pannonian Basin and in the Alps belong to the same regional scale fluid flow system, which developed during the advanced stage of the opening of the Neo-Tethys Ocean. The common origin and ore formation process is more evident considering results of large-scale palinspastic reconstructions. These suggest, that the studied deposits in the central part of the Pannonian Basin were located in a zone between the Eastern and Southern Alps until the Early Paleogene and were emplaced to their current location due to northeastward escape of large crustal blocks from the Alpine collision zone. Abstract: The Eldivan Ophiolite, exposed around Ankara and Çanklrl cities, is located at the central part of the Izmir- Ankara-Erzincan Suture Zone (IAESZ). It represents fragments of the Neotethyan Oceanic Lithosphere emplaced to- wards the south over the Gondwanian continent during the Albian time. It forms nearly complete series by including tectonites (harzburgites and rare dunites), cumulates (dunites, wherlites, pyroxenites, gabbro and plagiogranites) and sheeted dykes from bottom to top. Imbricated slices of volcanic-sedimentary series and discontinuous tectonic slices of ophiolitic metamorphic rocks are located at the base of tectonites. Plagiogranitic rocks of the Eldivan Ophiolite are mainly exposed at upper levels of cumulates. They are in the form of conformable layers within layered diorites and also dikes with variable thicknesses. Plagiogranites have granular texture and are mainly composed of quartz and plagio- clases. The occurrences of chlorite and epidote revealed that these rocks underwent a low grade metamorphism. Eldivan plagiogranites have high SiO2 content (70—75 %) and low K2O content (0.5—1 %) and display flat patterns of REE with variable negative Eu anomalies. LREE/HREE ratio of these rocks varies between 0.2—0.99. All members of the Eldivan rocks have high LILE/HFSE ratios with depletion of Nb, Ti and P similar to subduction related tectonic settings. Geochemical modelling indicates that the Eldivan plagiogranites could have been generated by 50—90 % fractional crystallization and/or 5—25 % partial melting of a hydrous basaltic magma. Abstract: A new plant assemblage of Cerová-Lieskové from Lower Miocene (Karpatian) deposits in the Vienna Basin (western Slovakia) is preserved in a relatively deep, upper-slope marine environment. Depositional conditions with high sedimentation rates allowed exceptional preservation of plant remains. The plant assemblage consists of (1) conifers represented by foliage of Pinus hepios and Tetraclinis salicornioides, a seed cone of Pinus cf. ornata, and by pollen of the Cupressaceae, Pinaceae, Pinus sp. and Cathaya sp., and (2) angiosperms represented by Cinnamomum polymorphum, Platanus neptuni, Potamogeton sp. and lauroid foliage, by pollen of Liquidambar sp., Engelhardia sp. and Craigia sp., and in particular by infructescences (so far interpreted as belonging to cereal ears). We validate genus and species assignments of the infructescences: they belong to Palaeotriticum Sitár, including P. mockii Sitár and P. carpaticum Sitár, and probably represent herbaceous monocots that inhabited coastal marshes, similar to the living grass Spartina. Similar infructescences occur in the Lower and Middle Miocene deposits of the Carpathian Foredeep (Slup in Moravia), Tunjice Hills (Žale in Slovenia), and probably also in the Swiss Molasse (Lausanne). This plant assemblage demonstrates that the paleovegetation was represented by evergreen woodland with pines and grasses in undergrowth, similar to vegetation inhabiting coastal brackish marshes today. It also indicates subtropical climatic conditions in the Vienna Basin (central Paratethys), similar to those implied by other coeval plant assemblages from Central Europe. 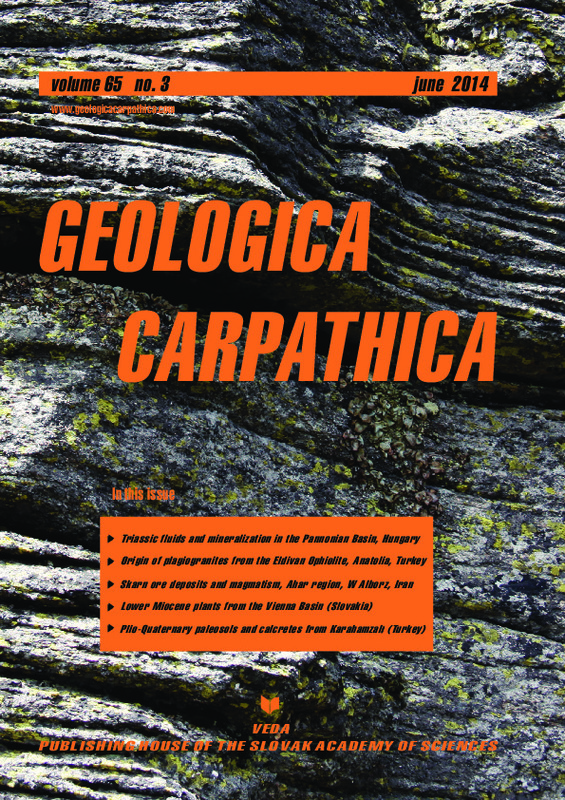 Abstract: We present the mineralogical, micromorphological, and geochemical characteristics of the paleosols and their carbonates from Karahamzall, Ankara (Central Turkey). The paleosols include calcretes of powdery to nodular forms and alternate with channel deposits. The presence of pedofeatures, such as clay cutans, floating grains, circumgranular cracks, MnO linings, secondary carbonate rims, traces of past bioturbation and remnants of root frag- ments are all the evidence of pedogenesis. Bw is the most common soil horizon showing subangular-angular blocky to granular or prismatic microstructures. Calcretes, on the other hand, are evaluated as semi-mature massive, nodular, tubular or powdery forms. The probable faunal and floral passages may also imply the traces of life from when these alluvial deposits were soil. The presence of early diagenetic palygorskite and dolomite together with high salinization, high calcification and low chemical index of alteration values are evidence of the formation of calcretes under arid and dry conditions. δ13C compositions of the carbonates ranging from —7.11 ‰ to —7.74 ‰ VPDB are comformable with the world pedogenic carbonates favouring the C4 vegetation; likely δ18O compositions of the carbonates are between —3.97 ‰ and —4.91 ‰ which are compatible with the paleosols formed under the influence of meteroic water in the vadose zone.